No home or office is complete without a classy, well-polished flooring, especially if it's made out of wood. But what makes wooden flooring so special? Because unlike the plain, cold tiles that you're so used to seeing in every kitchen, wood flooring is warmer to the touch, makes rooms feel brighter and more cheerful, and will never go out of fashion. 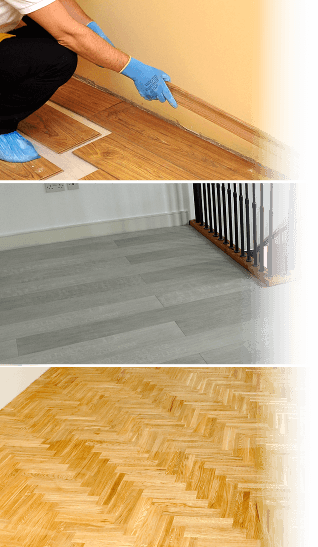 So, if you're looking for a professional wooden flooring installation and excellent workmanship, then Fantastic Handyman is the right company for you. When the time has come to replace your worn out carpet or cracked tiles, you can always count on Fantastic Handyman to lay your majestic-looking hardwood or laminate flooring right. The fantatsic wood flooring installers can readily update the floor of your home, office, store, hair salon, and that of other properties. If your renovation is limited to a single room instead, for example your bathroom or basement, the specialists will happily assist you with bathroom laminate or basement flooring. Once you book our flooring services, a polite and knowledgeable professional will arrive at your property within the next 48 hours to perform a thorough survey. When your room or rooms have been fully evaluated, the expert will suggest the wooden flooring type that will best suit your needs. Don’t worry if your wood floor fitting project ends up being a bit too complicated – the precise and swift team is no stranger to advanced installation methods, such as floating, gluing, and secret nailing. As soon as you've selected the type of flooring you wish to have, we will reflect your flooring installation cost in your final price quote. The skilled and well-trained fitters and sanders will put all their vast knowledge to the test in order to install your flooring to your specifications. Whether their task requires laying oak flooring, hardwood and laminate flooring, walnut flooring, or even installing engineered hardwood, the qualified professionals will always be able to stay true to your aesthetic choice. You won't even have to provide the handymen with a tape measure – the pros have all they need to start laying your hardwood or laminate flooring as soon as they come in through your front door. The tidy and efficient experts will work diligently to ensure that all boards fit perfectly together, will keep commotion to a minimum, and will maintain their work area sparkling clean. When the specialists are tasked with wood laminate flooring installation or start fitting your solid wood flooring, they will offer you to undercut the skirting. With this service, your current skirting won’t have to be removed. Instead, the experts will use special tools to adjust the skirting to the new floor level and will carefully slide the new boards underneath it. Regardless if you need laminate or hardwood flooring, you can always find us 24 hours a day, 7 days a week (bank holidays included). You can book your session at any time you wish – a few clicks is all it takes to get in touch with our friendly advisers. As for service coverage, the handymen will have no trouble attending all areas within M25.